U. WASHINGTON (US) — By skimming only the surface, decades of research into how much plastic litters the ocean may vastly underestimate the true amount of debris in some cases, new findings show. While working on a research sailboat gliding over glassy seas in the Pacific Ocean, oceanographer Giora Proskurowski, a researcher at the University of Washington, noticed something new: The water was littered with confetti-size pieces of plastic debris, until the moment the wind picked up and most of the particles disappeared. After taking samples of water at a depth of 16 feet (5 meters), Proskurowski discovered that wind was pushing the lightweight plastic particles below the surface. Reporting in the journal Geophysical Research Letters, Proskurowski and co-lead author Tobias Kukulka of the University of Delaware, write that data collected from just the surface of the water commonly underestimates the total amount of plastic in the water by an average factor of 2.5. “That really puts a lot of error into the compilation of the data set,” Proskurowski says. The paper also detailed a new model that researchers and environmental groups can use to collect more accurate data in the future. Plastic waste in the oceans is a concern because of the impact it might have on the environment. For instance, when fish ingest the plastics, it may degrade their liver functions. The particles also make nice homes for bacteria and algae, which are then transported along with the particles into different regions of the ocean where they may be invasive and cause problems. Proskurowski gathered data on a 2010 North Atlantic expedition where he and his team collected samples at the surface, plus an additional three or four depths down as far as 100 feet. “Almost every tow we did contained plastic regardless of the depth,” he says. The team plans to publish a “recipe” that simplifies the model so that a wide range of groups investigating ocean plastics, including those that aren’t oceanographers, can easily use the model. Following the recipe, which is available by request, might encourage some consistency among the studies, he says. “On this topic, what science needs to be geared toward is building confidence that scientists have solid numbers and that policy makers aren’t making judgments based on CNN reports,” he says. Descriptions of the so-called great Pacific garbage patch in widespread news reports may have led many people to imagine a giant, dense island of garbage while in fact the patch is made up of widely dispersed, millimeter-size pieces of debris. In the future, Proskurowski hopes to examine additional factors, including the drag of the plastics in water, complex ocean turbulence and wave height, that might improve the accuracy of the model. 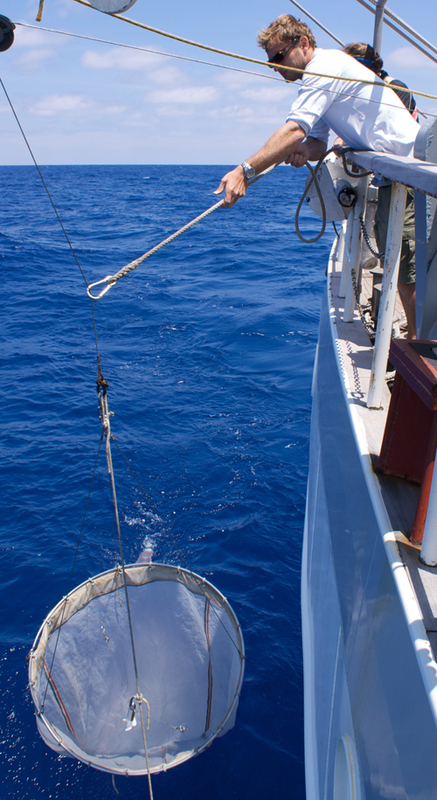 He also may have the chance to examine the relationship between wind speed and depth of plastic particles. The 2010 expedition had near-uniform wind conditions so the researchers were unable to test that relationship. “This is a first pass,” he says. Researchers from the University of Delaware, Sea Education Association, and Eckerd College contributed to the research that was funded by the National Oceanic and Atmospheric Administration. The researchers relied on data collected by students participating in the Sea Education Association’s Plastics at SEA program.